If you haven't made a quiche in a while it's time to make one. 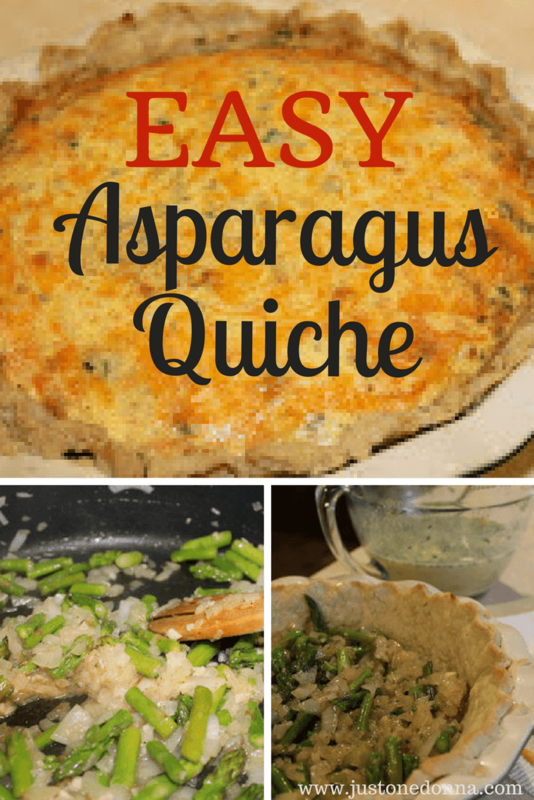 This fresh asparagus quiche is perfect for the season. 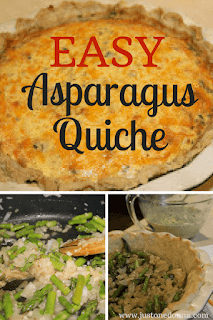 You'll find asparagus in your grocery store's produce section at a reasonable price during the spring months, so now is the time for this fresh asparagus quiche. Quiche is the perfect dish in my opinion. It makes a delicious meal any time of day. The combination of eggs, cheese, and vegetables is satisfying as well as delicious. You can serve it warm, cold, or at room temperature, too. You can't make a more versatile dish! Some of you may shy away from making a quiche at home because you don't like to make pie crust. Well, don't let that stop you. Go ahead and buy a prepared crust. There is no judgment here. If you do want to make your own crust, try making my food processor dough recipe. It's quick and no fail. I think you will like it for all of your pies, including this quiche. Cheese is important in this quiche, so be sure to choose a cheese you really like. I've used Colby-Jack cheese here, but any combination of cheeses will work. Just don't skimp on the cheese. This recipe uses half-and-half, but you can use whole milk or a combination of milk and half-and-half. Be sure to let your quiche rest and cool a bit before serving. It will cut into nice serving pieces more easily if you let it set. Feel free to make your quice a day ahead of serving. Just chill it in the refrigerator until you are ready to serve it. If you want to warm it, the quiche will reheat well in either your oven or the microwave. Preheat your oven to 425 degrees F. Roll the pie dough out to fit a large, deep-dish pie pan. Place the dough in the pan, crimping the edges. Prick the dough with a fork and bake on the center rack of the oven for 8-10 minutes until lightly browned. Remove from the heat to cool and turn the oven temperature down to 325 degrees F.
While the pie shell is baking, melt the butter in a large skillet over medium-high heat. Add the onion, asparagus, cayenne pepper, 1/2 teaspoon of salt, 1/4 teaspoon of black pepper and garlic. Cook until the onions are tender and the mixture is yummy. Remove to a bowl to cool. In a large bowl. mix the chives, mustard, eggs, half and half, nutmeg, 1/2 teaspoon salt and 1/4 teaspoon black pepper until well combined. Spread the asparagus mixture in the pie shell. Pour in the egg mixture and top with the shredded cheese. Bake for 45 minutes, until the center of the quiche is set. Remove the quiche from the oven and cool for 30 minutes or more. Cut into wedges and serve.